Teen Tech Week - Library Website Scavenger Hunt! 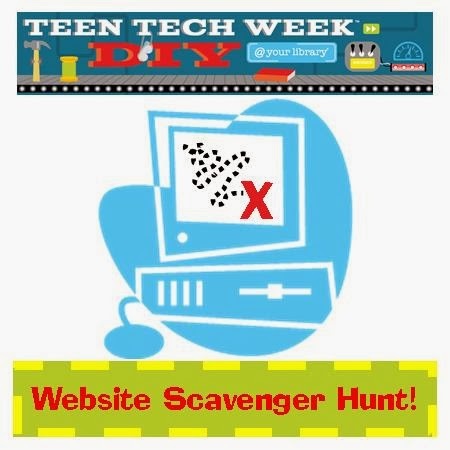 In celebration of Teen Tech Week 2014 - DIY @ Your Library - we will be having a Library Website Scavenger Hunt! Starting on Sunday March 9, teens in grade 6-12 can pick up a copy of the scavenger hunt questions at the Reference Desk or in the Teen Area. Use the library's website to complete the form, then turn it in at the Reference Desk to claim a piece of candy and be entered into a prize give away! Plus, to make Teen Tech Week last a little longer....I am giving you the WHOLE MONTH OF MARCH to get in and fill out a form!! Besides the Scavenger Hunt (did I mention you get CANDY if you turn in a form??) there are A TON of books and DVDs at the Library that can show you how to DIY any number of things (knitting, crochet, repainting your furniture, making stuff out of household items, etc...) If you can think of it, we can show you how and where to find the instructions! Just ask!